The Dallas Suite is NZ made by EJP furniture in Auckland. Available in your choice of Charles Parsons or Warwick Fabrics. 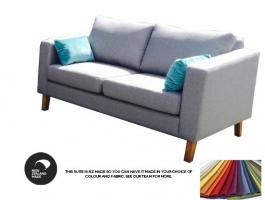 This suite has double sided seat and back cushions and sits on Chrome coloured legs. Visit our team instore to discuss colour and style options. Please allow 5 weeks for delivery as it is custom made.